Early summer is filled with color. 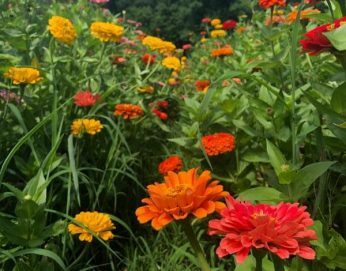 Our zinnias are happily basking in the heat and producing luscious flower heads, which have been weathering some pretty spectacular afternoon/evening storms. These storms have provided our veggies with quite a drink, and their timing has allowed the farmers and workshares to harvest our super productive plants. This week at our market booths and farm stand you will find basil, beans, blackberries, blueberries, Carmen peppers, carrots, chard, collards, cucumbers, green kohlrabi, jalapeño peppers, kale, Patty Pan squash, tomatoes, Zephyr squash, and zucchini. Crabtree accepts cash, check, credit cards and EBT.